A busy evening of school council, Knights of Columbus paperwork and an evening Mass. Today is Ash Wednesday which marks the start of Lent. Our foreheads are marked with ashes in the shape of a cross. 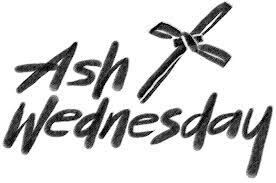 Ashes are a symbol of penance made sacramental by the blessing of the Church, and they help us develop a spirit of humility and sacrifice. Ashes were used in ancient times to express mourning. Dusting oneself with ashes was the penitent's way of expressing sorrow for sins and faults. The ashes are made from the blessed palms used in the Palm Sunday celebration of the previous year. The ashes are christened with Holy Water and are scented by exposure to incense. I told my boys that we do not wash the ashes off our foreheads because we marked with ashes to humble our hearts and reminds us that life passes away on Earth. Fasting is not something that I observe, with the exception of eating fish on Fridays. I am looking forward to doing the Stations of the Cross throughout Lent. Observing the stations is one of my favorite R.C. traditions as it forces me to reflect on the sacrifices that Christ made for his followers. We are proud to follow our convictions and participate in this season of penance and reflection which prepares us for Christ's Resurrection on Easter Sunday, through which we attain redemption. Thought I was reading something pre abuse scandal era, or possibly from the Philipines. For that matter, this has similar thrust as some of the moderate opinions coming from say - Quatar, or Bahrain. i am a little shocked. That I am a practicing cafeteria Catholic, that it has been part of my life and provides a great deal of spiritual comfort. No one can defend the abuse scandals or those that covered them up. It seems that a great number of people who mention church scandal have never been personally victimized and use the abuse as a reason to be bigoted. There is a false notion that sexual abuse is more pervasive in the Catholic Church than other institutions. A number of studies and reputable (non-Catholic) professionals have reported that there is no more scandal in the Catholic Church than in other religious denominations, institutions, educational setting, etc. I was baptized a Roman Catholic but no longer attend church. My parents were staunch in their support of the institution. The hypocrisy of protecting these pedophiles turned me. God could not be part of such a corrupt organization. The church is ruined.